A second post on the Four Lines Modernisation (4LM) including a look at the trains and track transmitters. 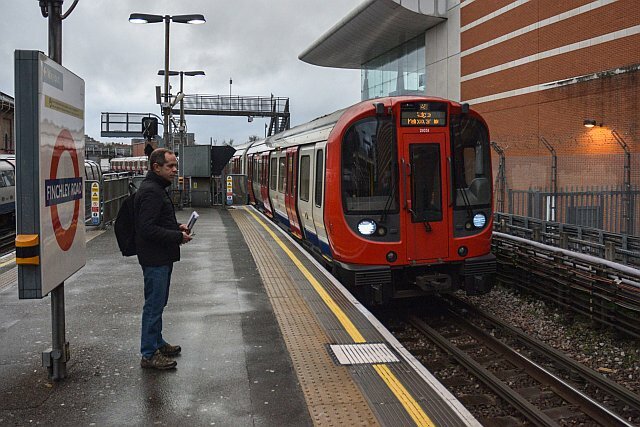 The recent Easter weekend tests on the Edgware Road – Hammersmith Line were apparently successful – each station had engineers with computers testing the trains’ progress to see how they managed the system and their ability to stop at the platforms accurately. 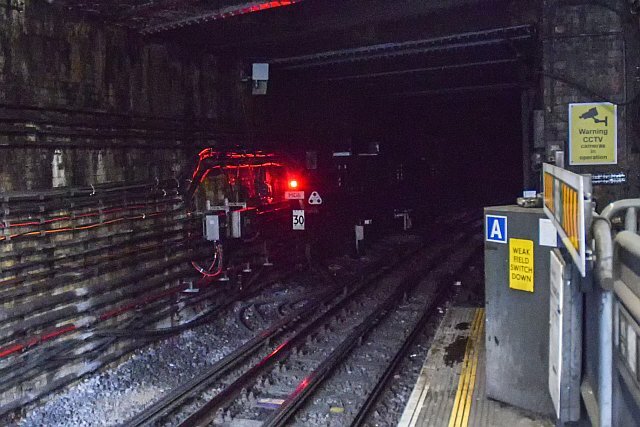 It seems the roll-out of the new ATO system is slightly behind because the Baker Street junctions and Finchley Road/Paddington to Euston Square have not been tested thoroughly yet athough partial testing as far as Baker Street has been undertaken on at least one occasion. 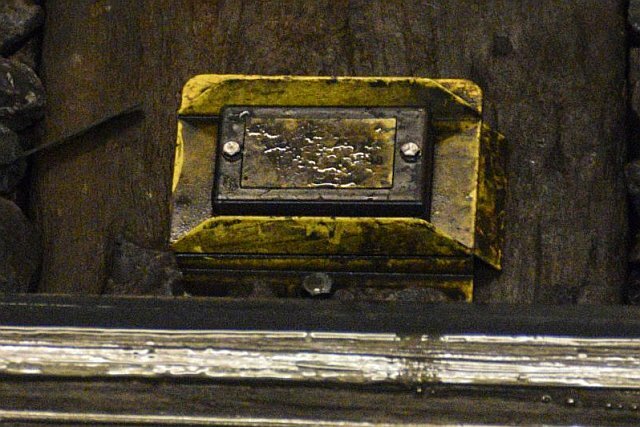 The trains themselves (both S7 and S8 stock) have been getting front end modifications – essentially a pair of receivers (or small black boxes for want of a better word.) A handful of battery electric locomotives have received the modifications too however those receivers are much bigger and painted yellow to match the locomotives. These larger appliances would look out so of place on the S stock! Althought most S Stock now has ATO, there’s a small number still without the mods. Its planned to have all units done by this September. Apparently it takes three weeks to do just one unit, this includes fitting out and testing which means there’s probably eight to ten S Stock trains still to do. In the past two days I have seen at least two non ATO units in operation. 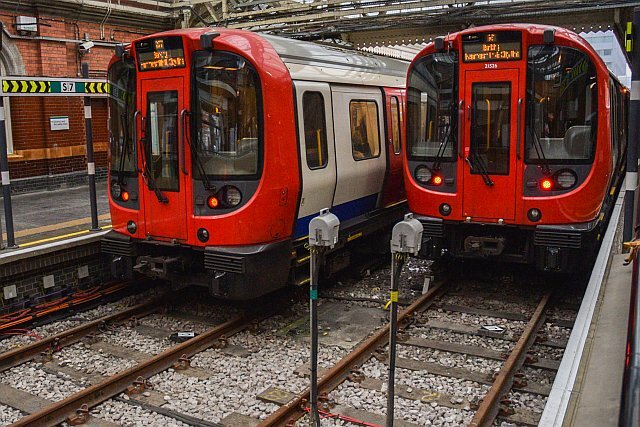 The Communications Based Train Conrol (CBTC) or Automatic Train Operation (ATO) as some of us like to call it, is still being fitted to the system. 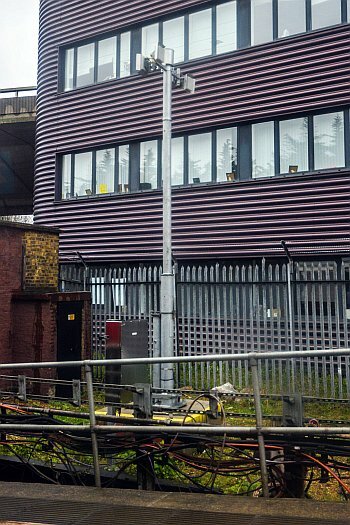 Even though successful tests have been carried out between Edgware Road and Hammersmith, there is still a lot to do including completion of the wi-fi masts and track balises. One reason for deciding upon the use of wi-fi/radio transmission is LUL’s expreience with the Central, Northern and Jubilee Lines. 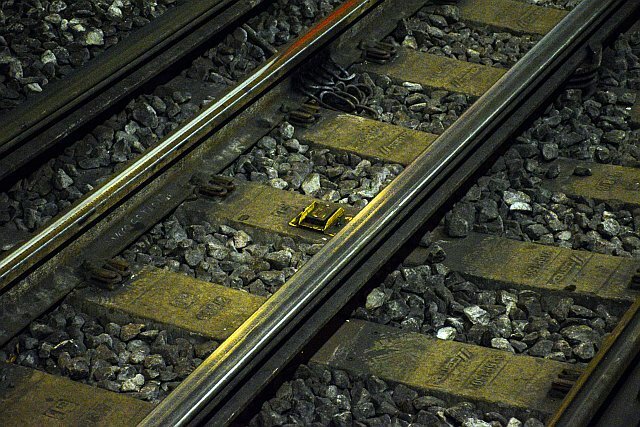 When conductor shoes inadvertently drop off they usually damage the very cables needed to run the ATO systems, meaning the entire line goes down. 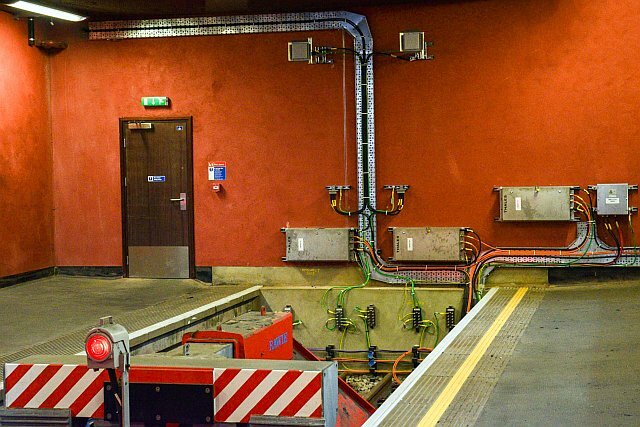 The new system does away with cabling – at least in the ‘four foot’ anyway – there’s still loads of it outside the ‘four foot.’ The arrangement ensures that even if one transponder on the new system should fail or gets damaged, the trains will still cope, there will be no need to suspend the whole service. The neccessary work to fix the damaged units can be undertaken at night. 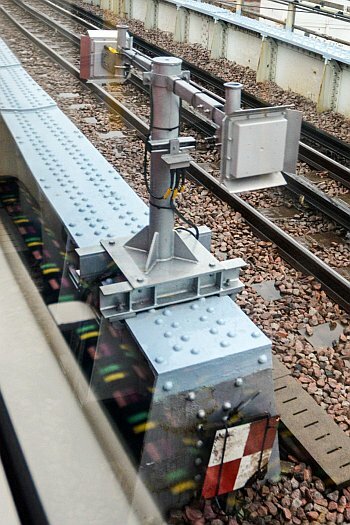 The trains receive information by means of the transmitters, and also gather information by means of ‘tags’ (or transponders – these are track mounted balises) along the track such as the trains’ positioning, distances to stations, junctions, application of the brakes etc. The tags don’t do anything other than emit a signal to confirm their location and are not wired up in any way. They rely on small batteries which Thales claim will last up to ten years in normal use. The equipment on board the trains should be able to do a number of things, not just take the train from one station to the next. They should be able to detect train loading and adjust power as is neccessary, not only that detect faulty traction motors, local conditions (such as rain, slippery rails etc) and still maintain the appropriate acceleration rates. In addition they should be able to open the train doors at platforms and also close them after a set amount of time, especially in colder weather. Otherwise the driver still operates the doors and sets the ATO in motion. 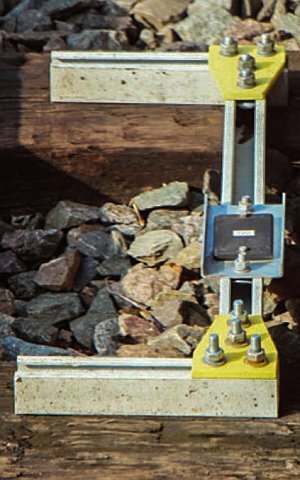 These ‘tags’ or rather track balises (as Thales calls these) are small and quite hard to spot. It took me some time to find my first ones. I dont think these are as frequent on the Hammersmith branch as that’s a fairly straightforward railway (apart from the Hammersmith terminus itself.) Conversely eastwards of Baker Street there’s more – at least three in each direction can be found within the tracks at Great Portland Street and Euston Square. It seems to me the number depends on the location such as intensity of train service (eg 32 tph,) junctions, crossovers etc. As far as I can see there are none from King’s Cross station and points eastwards although there are balises up to the new crossovers west of King’s Cross. There are more of these at Baker Street station (probably every 10-15metres) because the trains need extra information at the junctions and negotiating the sharp curves. Edgware Road is too like Baker Street, a busy station with many crossovers, platforms and severe speed limits etc, so more balises will too be found here although so far it seems few have been installed. One strange result of the ATO is the fact FOUR signals can be seen for trains starting from platform two at Edgware Road! 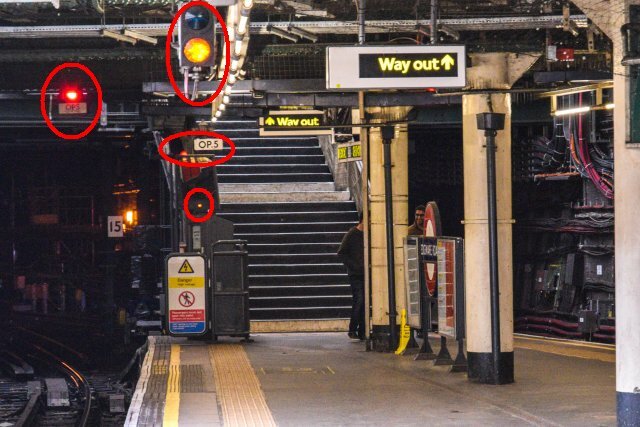 There’s the new signal (OP5) high up on the bridge, old signal (again OP5) by the steps, the minature repeater (OP5) on the mirror (this is a somewhat unusual feature on the tube by the way) and the platform repeater (not forgetting the ATO signs that are still under wraps.) I assume it will be like this until 2019 when the old signals can be removed. 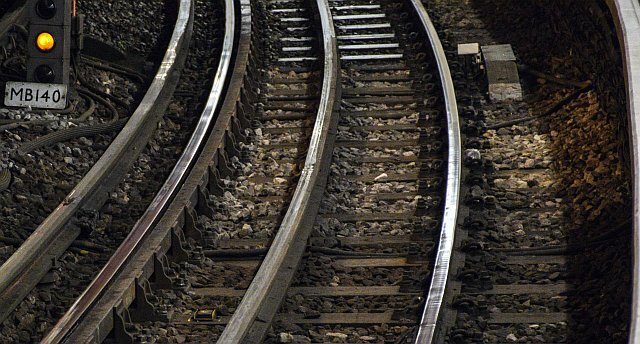 Both ATO and the old signalling system have to be kept together for at least a year to provide a back-up should the ATO should fail for some reason. From what I have observed, the new ATO system includes a white proceed signal, much like those on the Victoria and Jubilee Lines. 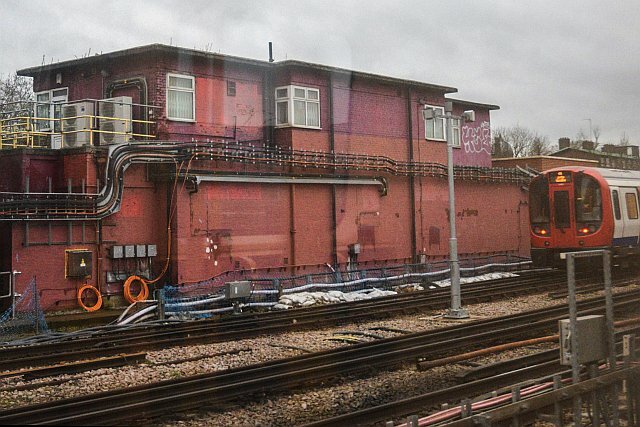 One such example is the up Met signal MD6 at Finchley Road which is certainly using its proceed signal – interesting as I havent seen these in use anywhere else on the 4LM yet. One fact not discussed by anyone is there will be two completely different ATO systems parallel between Westbourne Park and Royal Oak – the tube and Crossrail. 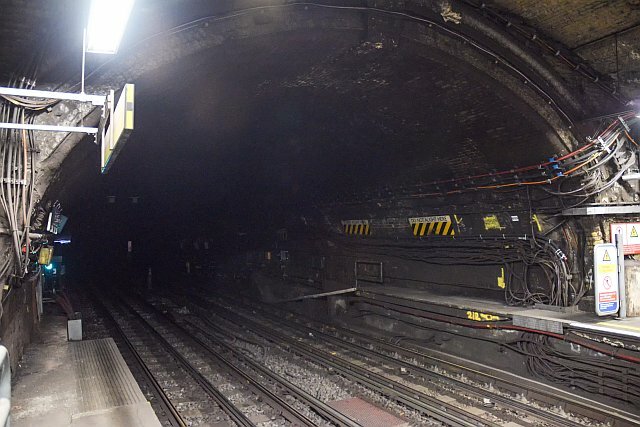 The Circle and Hammersmith lines will of course ‘go live’ well before Crossrail. 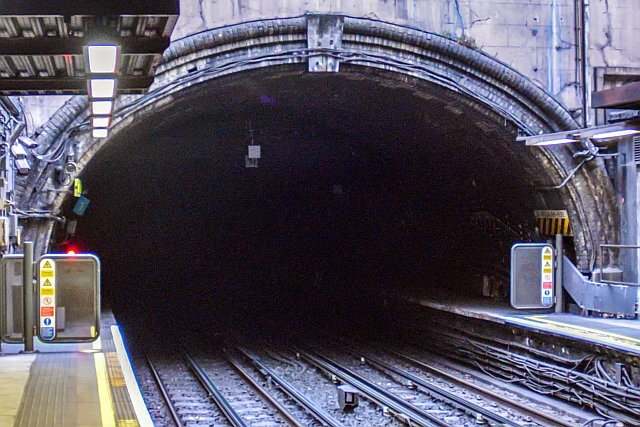 Although Crossrail meets the tube at other locations this will be the only place in London where one can see Crossrail trains from the tube and vice versa (when Crossrail, as the Elizabeth Line, is activated throughout to Heathrow/Reading.) There will also be the unique situation – for a while – where one can see both ATO and non ATO Elizabeth Line trains from the Hammersmith line! The only other section of parallel ATO running is at Custom House where Crossrail meets the non tube Docklands railway. Next Post: 2001: That hotel room! 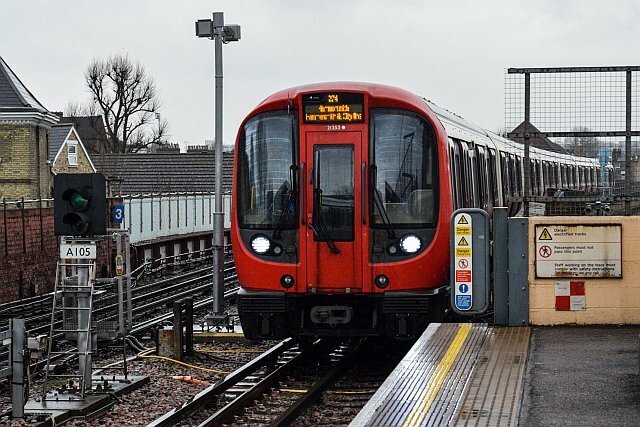 Don’t forget Stratford (tube, in two different flavours of ATO, plus the DLR with another – making four different ATO systems at one station, possibly a world record)! Yes I havent forgotten Stratford. I was specifically referring to Crossrail/Elizabeth Line and the tube however. “this will be the only place in London where one can see Crossrail trains from the tube and vice versa” – Central line (tube) at Stratford, and Crossrail/Elizabeth Line at Stratford – easily visible from each other! You have not read my post. I specifically referred to ATO operation. 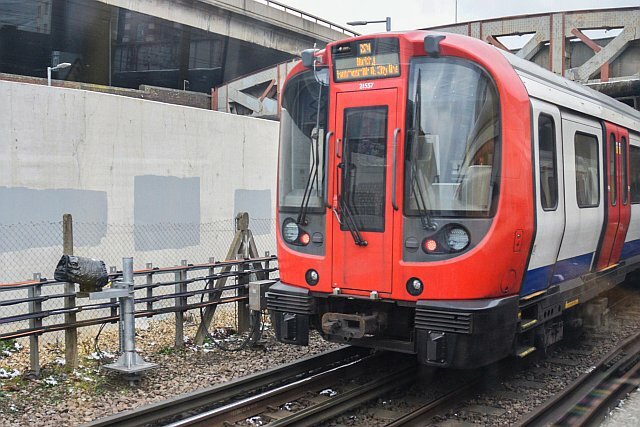 Yes Crossrail/Elizabeth Line and Central Line can be seen at Stratford together but NOT in ATO operation and probably wont be for quite sometime until ATO/CBTC comes to the Great Eastern.